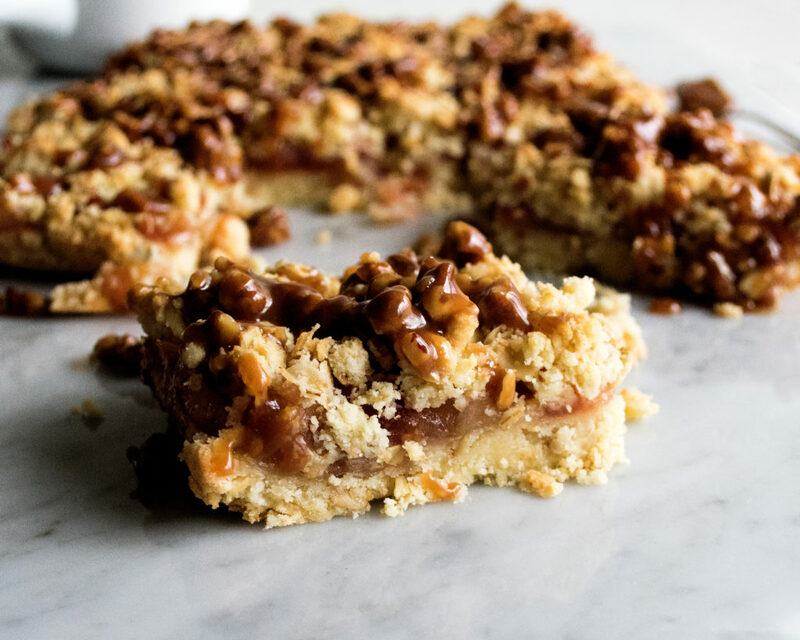 These are the messiest, most delicious apple crumb bars, and they are addictingly good. 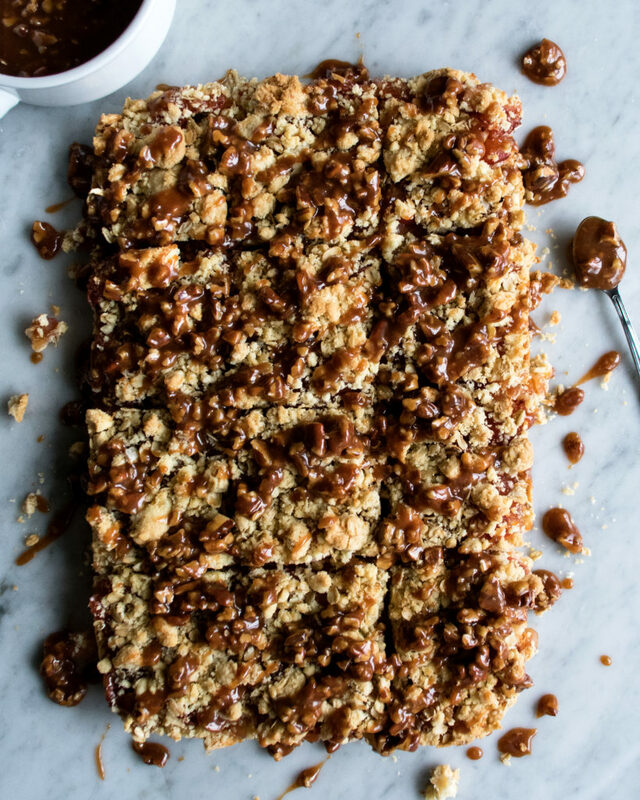 Plus, there’s a salted pecan caramel to generously drizzle over the buttery streusel topping. It is basically fall wrapped up in a small, sweet bite. The fall baking has been happening over here around the clock. I can’t seem to shake the ever persistent desire to heat up the oven, lay out my flour, sugar, and measuring spoons on the candle-lit counter, and get something sweet going. It’s calming, comforting, and productive all at the same time. One of my favorite dessert components is a good old fashioned streusel topping. When I was young, I asked my grandma how she made the streusel part of her apple pie. 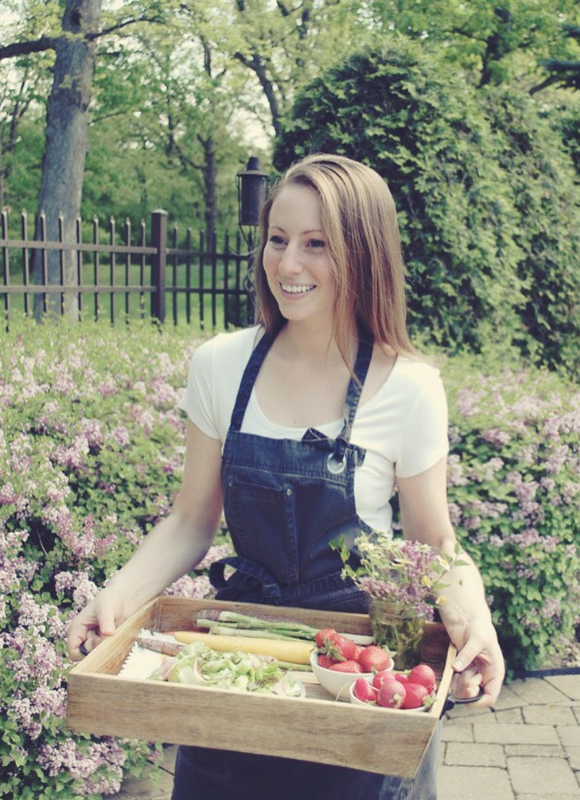 I’d work the flour, sugar, and butter together only to then eat it raw. Yes, raw. And by the spoonful! It was my secret guilty pleasure and I have from then on been obsessed with streusel toppings. 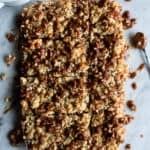 These apple crumb bars use a streusel mixture for both the first base layer and also the crumb topping. You’ll combine the ingredients together in a food processor, reserve a portion for the top, and then press the remaining mixture firmly into the bottom of a baking dish. From there, a sweet, stovetop apple filling gets slathered across the bottom layer. And then goes all the remaining streusel right on top! Warning: these apple crumb bars may fall apart. And I am totally okay with that, so hopefully you are, too! I mean, they aren’t called crumb bars for nothing. I think they are best eaten right out of the oven, when they barely hold their shape when cut. And trust me, the messiness is worth every sweet, buttery bite. Eat them plain or with a drizzle of the salted pecan caramel right over top. Either way, these are such a treat that everyone will LOVE. 1. Preheat the oven to 375F. Prepare a greased 9×13 baking dish with a piece of parchment paper. 2. Combine the apples, sugar, lemon juice, and water in a small saucepan over medium-high heat. Bring the mixture to a boil. Reduce the heat to medium-low and cook for about 30 minutes until reduced and syrupy. Turn off the heat and let cool. 3. In a food processor, combine the flour, sugar, and salt. Pulse until incorporated. Add the cold, cubed butter and continue to pulse until the mixture resembles coarse crumbs. Transfer the mixture to a mixing bowl and add the oats. Use your hands to mix. 4. Reserve about 1 ½ cups of the mixture. Spread the rest into the prepared baking dish. Press it evenly so that it forms a solid layer of dough on the bottom of the pan. Bake this crust layer for 8 minutes. Remove the pan from the oven and let the crust cool slightly. 5. Spread the apple mixture across the crust. Crumble the reserved flour mixture on top of the apples. Bake for 25 minutes until golden brown. 6. Let the bars sit for 20 minutes before lifting them out of the pan using the parchment paper to do so. Cut into 12 even, square pieces. 1. Meanwhile, in a small saucepan, add the heavy cream over low heat. Allow the cream to gently heat. 2. Combine the sugar and water in another small saucepan. Bring to a boil over high heat. Use the saucepan handle to swirl the pan around occasionally. Let the mixture continue to boil until it turns a light amber color (watch this carefully as it will burn very quickly if left on the heat too long). 3. Turn the heat off. Very carefully, gradually whisk in the heated cream. Do this slowly and be careful to not get splattered as the mixture will aggressively bubble. 4. Once the cream has been incorporated, return the pan to low heat. Stir in the pecans and sea salt. 5. Let the caramel simmer for 5 minutes. Turn off the heat and let cool slightly so that it thickens yet is still pourable. 6. 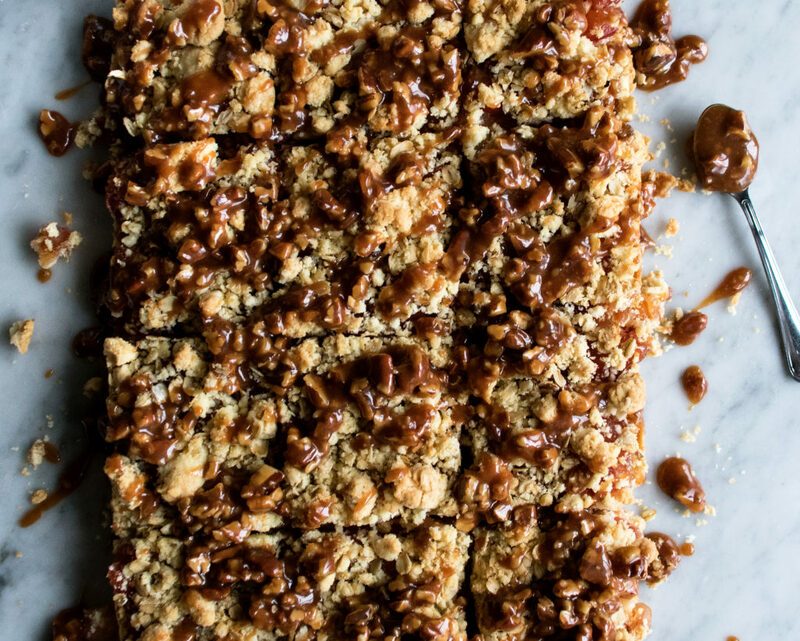 Serve the apple crumb bars with the caramel drizzled generously over the top. These look amazing!! Can they be frozen? They are SO good! I’ve never tried freezing them, but I feel like they would work. And then just defrost them in the fridge overnight or maybe try the microwave. Let me know if you try it out, and I hope you love them!